ZeoShredder is a secure file shredding program which enables you to get rid of unwanted files and ensures guarantee that they cannot be recovered! Its ultimate file shredding algorithms leave no chances to any file recovery utilities. The simple and friendly user interface allows you to easily shred not only single files but whole folders as well. It can Maximum private data protection when moving important information to other storage devices. a secure file shredding program to get rid of unwanted files. ...... from a flash card to a notebook, from a PC to a flash card etc. Deleting information from the old storage without using ZeoShredder gives an opportunity for strangers to recover your private data. The usage of ZeoShredder significantly increases your private security level when working with important and confidential information. ZeoShredder has significant advantages over similar products. Qweas is providing links to ZeoShredder 2.0 as a courtesy, and makes no representations regarding ZeoShredder or any other applications or any information related thereto. Any questions, complaints or claims regarding this application ZeoShredder 2.0 must be directed to the appropriate software vendor. 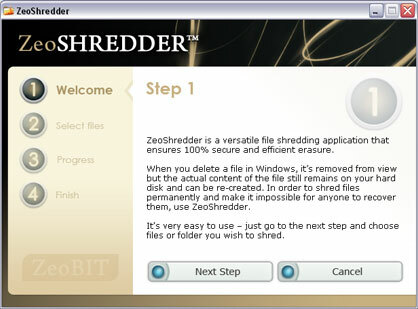 You may click the publisher link of ZeoShredder on the top of this page to get more details about the vendor.